​​​AUSTIN – While the growing Austin economy drives business for some sectors, others are being left behind. Case in point, it can be downright brutal to be a home-flipper. 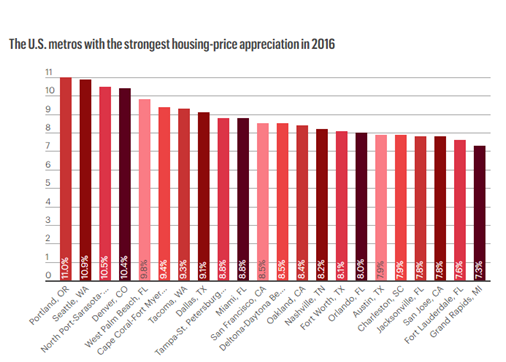 Due to a booming residential real estate market and extremely low inventory levels, Austin has one of the lowest rates of house-flipping in the nation at 3.4 percent. Austin's low home-flipping rate bucks a national trend: A combination of rising home prices and a stronger labor market have helped push home-flipping numbers to their highest levels in a decade. This graphic excludes Austin, where home sales have continued at a torrid pace for much of the last decade. A lack of supply makes it extremely difficult to find underpriced homes and turn them into profitable investments. The median sale price of a single-family home in the metro jumped 7 percent in 2016 while inventory sat at an unbalanced two months in December. ​Want more ​data? See Austin Housing Market Research.